I've decided to make sock knitting bags. One for me (on the right) and one for my Sockapaloooza Pal (on the left). 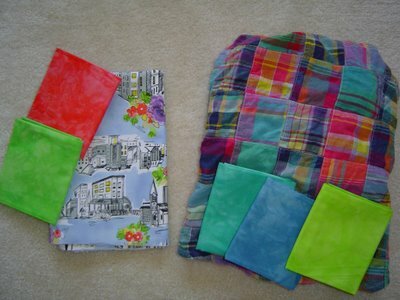 Sock knitting bags are of course different from regular knitting bags because - they're for knitting socks! I maybe have a sock knitting problem (finishing up pair number 10 for the year) and its maybe out of control, but at least I'll have a bag to put my problem in. With lots of little pockets to keep stuff. Obsessive compulsive? Who me? NEVER!If you're really, really curious about what I'm planning on putting in the pockets, you can check out my blog. I'm going to make my own pattern (the better to have the perfect combination of pockets!) so I've got to go measure some yarn!